New year after new year, thousands of people have a confessional. They identify who they've been in the past year and mutter these words, "I want to be a new person." Some make a big deal out of this, making themselves accountable to several eye witnesses, but for others this very important confessional takes place inside their own hearts with only an audience of one. Themselves. No matter where or when we choose to make this confessional, it is what we do with every rising sun & every impending new year. No, I am not specifically writing about new year resolutions. Just about the idea that there's something in all of us that strongly desires a clean slate when a new season comes. A chance to make things right again. A reinvention of self. A remodeling of the inside. An erasing of past mistakes, errors, or foolishness. A chance to prove that we can be who we claim we are, the vision of the best we can be. It's 2013, and I'm here to pour oil on your feet again, to encourage you about your new year. The truth is you can get a brand new slate, but not by your own strength. You have to let go 100% and just allow God into your life this year. You must accept His forgiveness for every stink in your past. Why am I so happy to tell you this? Because you have a forgiving Father. 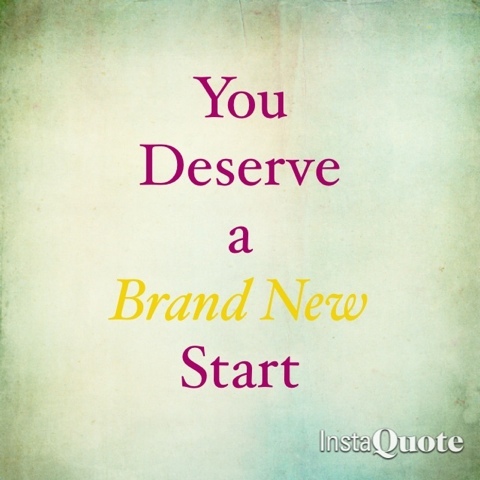 You might not even know how much He wants to love you, to give you a fresh start. But He does. He actually is really looking forward to it. "Blessed is he whose transgressions are forgiven, whose sin is covered. Blessed is the man to which The Lord does not impute iniquity." Psalm 32:1-2. David wrote this psalm in the period after he had done a sad thing and taken the wife of another man. It is who God has forgiven much that loves much. Some of you might feel like you're thoroughly 'clean' already, but some not so. It's the latter who will immediately run with this message and throw their arms in reckless abandon at a Father who truly loves and dares to forgive them. These are the ones who will truly be happy at this message, because they will be given the chance to start all over again. Please don't be angry if we choose to accept it. Allow us to reintroduce ourselves in 2013. We are indeed, "The Ones With the Brand New Slates." We can dance like David danced now. We can be free to be who God created us to be, forgetting the things of the past and stretching forward to receive the things of the future. Allow us to reintroduce ourselves. "The Ones With the Brand New Slates."